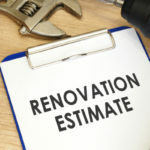 If you look into an older home which hasn’t had a makeover, you likely find the kitchen in the back of house, cut off from the rest of the living space. In days of old, the kitchen was used strictly for prepping, cooking, and cleaning up. Today’s kitchens have taken on the starring role in the home as gathering places where the whole family comes together. The trends for 2019 kitchens build on this role, combining style, comfort, warmth, and functionality. Modern kitchens are the center of the home, places where everyone can gather as meals are prepared and enjoyed together. 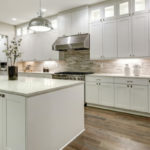 Let’s explore what’s trending in 2019 Kitchen Design. Though the popularity mid-century modern and farmhouse styles haven’t diminished, the simple streamlined kitchen is the current wave in kitchen design. Homeowners are looking for simple efficient design choices which deliver modern clean lines and stress free environments. One way this is accomplished is through the replacement of upper cabinets with open shelving, a trend which makes the kitchen appear brighter and more expansive while allowing counterspace to be utilized more effectively. The new simple, streamlined kitchen allows for unique accents like rough cut wood, industrial metals, natural stone, specialty tiles, and other design elements to show off your personal style. As kitchens adapt to clean lines and simple design, effective storage solutions are on the rise. Cabinets of the past offered a great deal of wasted space, too large or too small, with no way to organize your kitchen effectively. 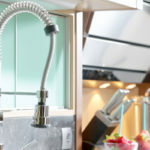 In the modern functional kitchen of 2019, cabinetry offers better storage solutions in the form built-in drawer dividers for organizing utensils and cutlery, appliance garages to hide small appliances away, roll-out caddies for pots and pans, pull-out trays for spices, deep drawers for larger items, and built-in trash bins for garbage and recyclables. 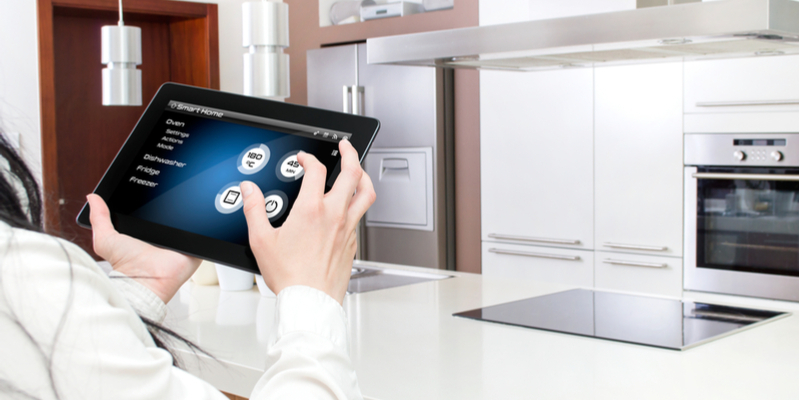 Technology continues to transform homes and the kitchen is no exception to the revolution. Many evolving technologies are being integrated into the kitchen – from the fridge to the faucets – and everything in between. New kitchens are designed as smart kitchens from the start, while older kitchens are being transformed with motion sensors, one-touch features, smart devices, and other gadgetry to make kitchen jobs easier and more convenient. Lights can be controlled via smart phone or tablet, while your refrigerator can help you with your grocery list. While stainless is still a popular choice, new colors and finishes for appliances are making a big splash in 2019. Pops of color and eclectic retro mismatching is the latest trend in kitchen appliances. Vintage styling in refrigerators and colors like red and blue are among the new year’s popular choices. Induction cook-tops and steam ovens are the latest “must haves” in the kitchen. The latest oven technology incorporates Bluetooth and allows you to control your oven from your smart phone. Islands remain as popular as ever taking center stage as focal points in modern kitchen design. Larger islands are trending for 2019, becoming multi-purpose marvels for storage solutions, seating and eating, meal prep, bar service, and more. While it’s true that white will likely never go out of style, all white kitchens are becoming a thing of the past. Colors and wood stain are trending for the new year as accent pieces deliver pops of color in modern kitchen design. The early color leaders are blues and greens, with jewel tones coming on trend as well. 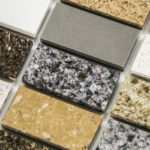 For countertops, Quartz and Granite remain the popular choices and offer a wide range of colors and patterns from which to choose. The emerging 2019 trending colors are taupe, gray, cream, and white, which add to the simple, clean lines homeowners are looking for today.